Today was a busy day in Koala class! We had a special visitor, Ms. Mc Donald who showed us so many fruit trees. She had bananas, grapes, apples, and oranges. The Koala class helped pick all the fruit and put it on the delivery truck to take to the fruit store. 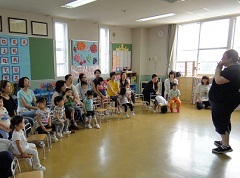 After that, Koala class went outside to play together. 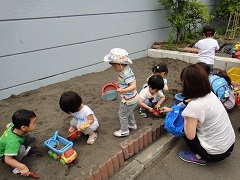 They really enjoyed all the toys and sand, building castles and using toy dump trucks. 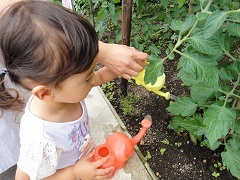 When we were finished, we went to see our mini tomato plans. Koala class’ tomato plants have been grow-grow-growing really well. Since plants need water, the last thing we did was water all of our plants. Thanks for a great day, Koala class! See you soon!